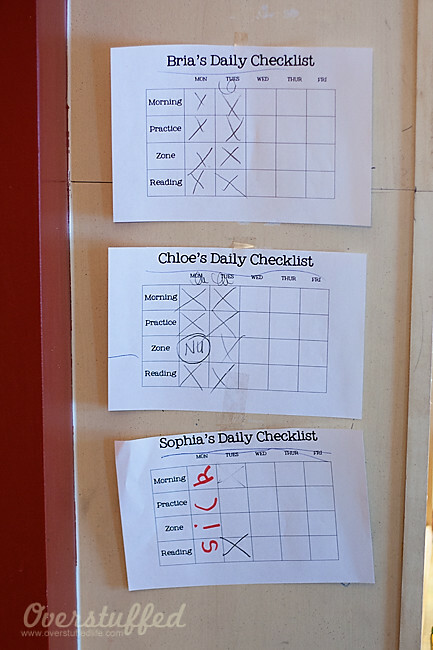 Recently, we implemented a new system for chores and allowance. It is still working really well, but I have not been super pleased with my ugly, taped to the cabinets, checklists. Then we started using a different brand of tape and it began to take the paint of the cabinets. This made the need to find a better way to put them up all the more immediate, and now it would have to include some way to hide the damage the tape had done to the cabinets already. If you look closely at the top of the photo, you can see where some of the tape damage is. Boo. I decided that a nice framed bulletin board right on the cabinet would look really nice, but I couldn't find one that was the right size anywhere. So I made one myself. I took measurements of the side of the cabinet, and then ran over to WalMart and found a frame that would fit all of the checklists and was the perfect size for the cabinet. 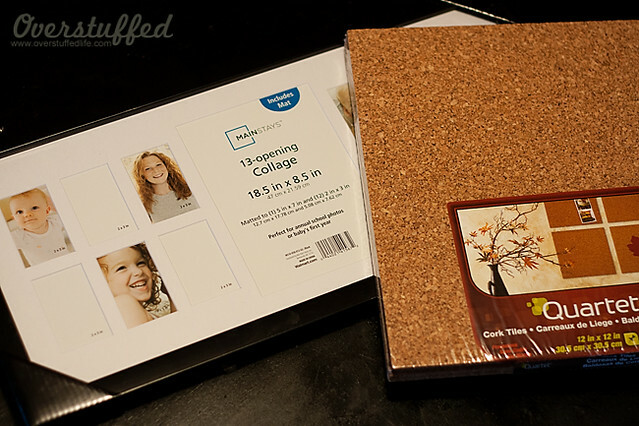 I also bought a package of square corkboard. I took everything out of the frame and used the glass as a template to cut the cork. Since my frame is rectangular and my cork was square, I had to cut two different pieces to fit. Once I had all of the cork cut out, I slipped it into the frame. 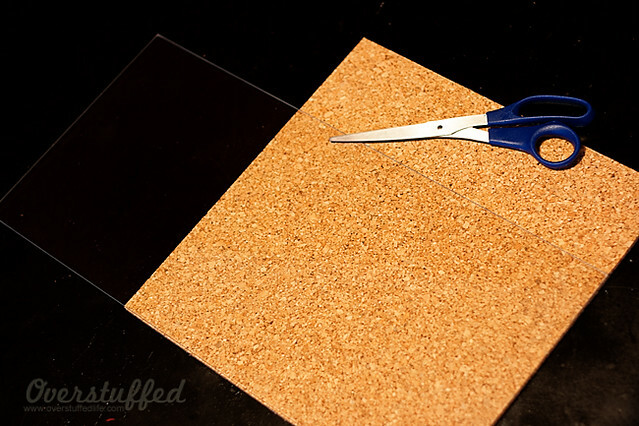 I just had to make sure that the place where I seamed the cork inside the frame was with two straight edges instead of the edges I had cut with scissors. As soon as the cork was in the frame, I added the back of the frame back on and used my favorite Command velcro picture hanger doodads to hang it on the cabinet. For about 15 minutes of work, I'm really pleased with how it turned out. 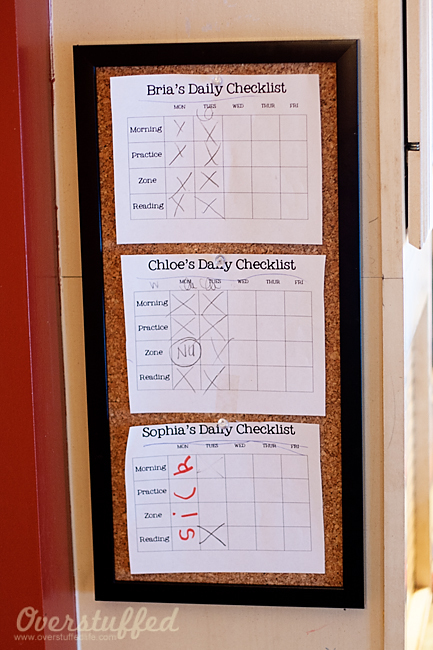 It makes my kitchen look a lot fancier and the girls have had renewed interest in their chore charts, too! 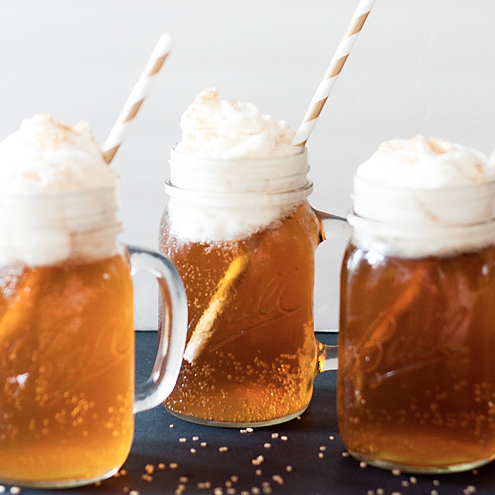 Hooray for functional AND beautiful! PS Chloe has already commandeered the extra cork and used it to make granola bars for her American Girl Dolls. She even painted one side of them with brown paint so they are chocolate covered. Love her. This post may contain affiliate links. For more information, please read my disclosure. Very creative! I don't even have a checklist at all. I really need to get with the program! And I wonder why I'm never organized! These checklists are the first time I've done any sort of checklist with my girls. 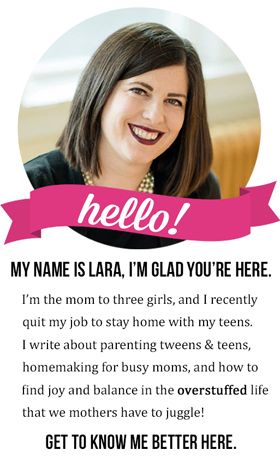 I'm amazed at how well they are working, though! What a great idea! This is so easy and could be used for so many different things. Great idea. There are so many uses for this. You have to run this again around New Years for all those getting organized. Whatever works, right? I wonder what I'll have to do when the bulletin board novelty wears off! Nice! I made something like this a few years ago on the inside of our computer armoire door. It worked great!